Those banners attached to streetlight poles that advertise such things as museum exhibits, music programs and other cultural and community events could one day soon display ads for movies, cars, soft drinks, and other commercial products and services. This coming Wednesday, the city council will consider a motion by Councilman Jose Huizar directing the city’s Chief Legislative Analyst, the City Attorney, and the Department of Public Works to report within 30 days on ways to generate revenue from the street banners that are now limited to qualified non-profits, with the names and logos of corporate or commercial sponsors limited to a small area. Huizar’s motion refers to estimates that the city’s street banner program could be modified to generate millions in new revenue, although it doesn’t identify the sources of those estimates. The motion mentions the city’s department of recreation and parks as a potential recipient of that revenue. The motion doesn’t name those cities, nor go into any detail about their banner policies. In California, San Diego has a street banner program for its downtown area, but the signs cannot advertise specific products or corporate entities. San Francisco has a street banner program, but it also prohibits advertising for businesses and products. 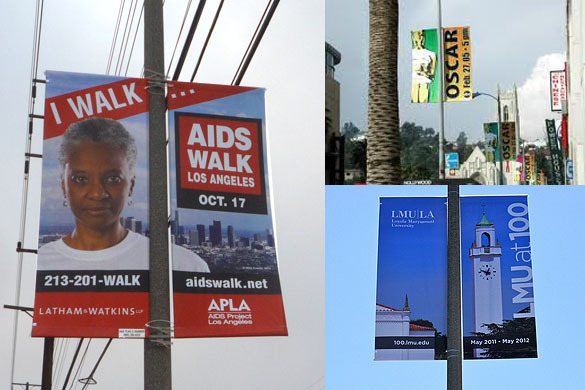 L.A.’s street banner program was first initiated by city ordinance in 1942, but most of the current regulations date from 1999. Permits are issued to qualified organizations by the city’s Public Works department, but the city receives no revenue beyond permit fees. The name and/or logo of a single corporate or other commercial sponsor may be placed on a banner, but is limited to an area no greater than 20 per cent of the total. Most banners can be kept up for a maximum of 90 days, but certain kinds can be permitted for as long as 360 days. Typical banners are 18 inches wide and up to 96 inches tall, and placed in pairs on opposite sides of light poles. Permits can also be obtained for banners that stretch entirely across a street, but those are seen much less frequently.